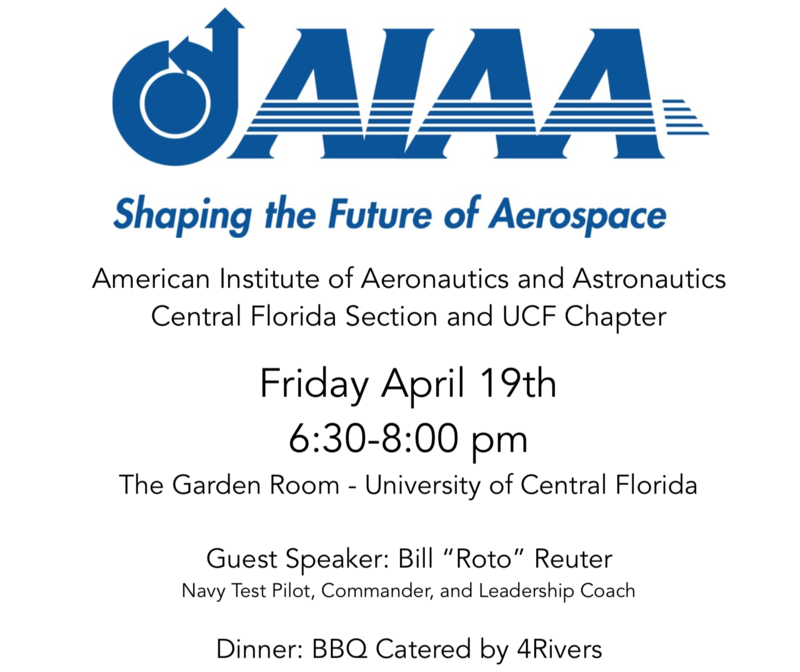 Join us for the Spring Aerospace Dinner at UCF, hosted with the AIAA UCF Student Chapter on Friday April 19th from 6:30 - 8:00 pm. Event will include dinner catered by 4Rivers, and a presentation by our guest speaker Bill "Roto" Reuter, a Navy test pilot who went on to lead over 1200 Navy professionals and is currently the President of R-Squared Solutions teaching leadership and business strategies to organizations all over the nation. Note: Event was re-uploaded due to an issue with our registration system, please use the link above to register and pay for the event. Previous page also included the wrong date, the event is the 19th of April.